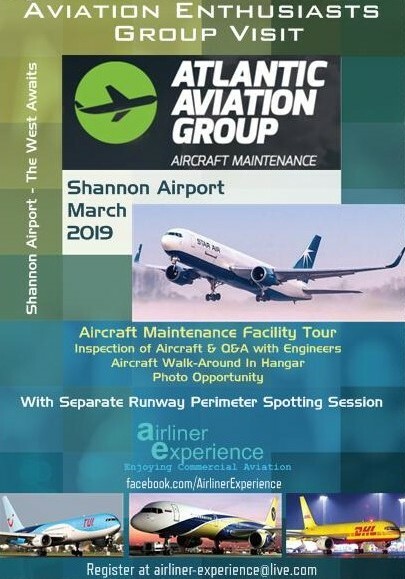 Airliner Experience is pleased to announce an Enthusiasts Group Visit to Atlantic Aviation Group – Hangar & Maintenance Facility at Shannon Airport & Runway perimeter vantage point spotting. This exciting tour will take place early March 2019 with proposed visit to several vantage points around the perimeter of the airfield as an intended ‘spotting’ opportunity. Transportation to and from the event will be by private executive bus only. Our Airliner Experience event will depart from near Dublin Airport at 6.45am by executive bus. 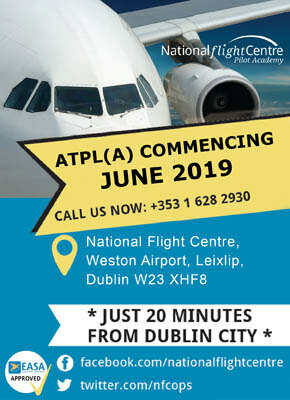 Upon arrival at Atlantic Aviation Group – Shannon Airport we will enjoy a company presentation at Atlantic Aviation Institute before the group is taken by bus to the maintenance hangar. This of course was the former Transaero Shannon operation, prior to being sold several years ago. The group will enter the MRO facility during the busy winter programme. Atlantic Aviation staff will lead us through the hangar viewing aircraft from well known airlines under various stages of maintenance with explanations being given throughout. Some notable aircraft and airlines which have received attention at Atlantic Aviation include, Star Air Cargo B767’s, TUI B737’s, B757’s & B767’s, DHL B757 & B767’s, British Airways, Belavia, Cygnus Air Cargo B757, Enter Air B737, EuroAtlantic, Icelandair B757’s, Jet2 B737’s & B757’s, even the occasional MD-11F and B777, along with B737 BBJ’s and B757 BBJ’s. Aircraft visit Atlantic Aviation from near and far including Russia and South East Asia for the expertise, skills and knowledge the MRO Atlantic Aviation Group has acquired at this prime geographical location, Shannon Airport. Once our visit to Atlantic Aviation Group is completed, it’s onto our bus which will deliver us to two prime vantage points where the group can engage in a period of aircraft spotting, overlooking the main runway. Shannon Airport, may not be known for it’s quantity of aircraft movements but certainly for it’s unusual visitors. Registration process will be through Airliner Experience. Don’t miss out – Join us !